This sketch, like many of Eakins’s paintings, betrays a tension between the two subjects he most favored: modern, psychological portraits and nostalgic, historical scenes of bygone years. Sketch for the Surrender of General Lee to General Grant at Appomattox depicts the April 9, 1865, surrender of the Army of Northern Virginia to the Union forces at the house of Wilmer McLean in Appomattox Courthouse, a village in central Virginia. Eakins began to paint it around the same time as his William Rush Carving His Allegorical Figure of the Schuylkill River (1876–77, Philadelphia Museum of Art); historical compositions were clearly on his mind, although he never completed a finished work on the subject of Lee’s surrender. 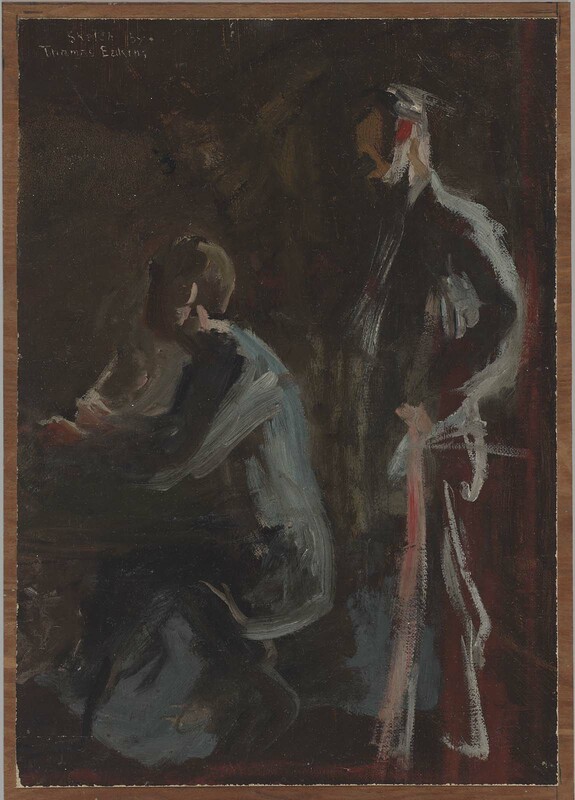 This sketch is typical of Eakins’s preliminary work and is composed of broad and vigorous brushstrokes that effectively render both the figures and the light with minimal attention to detail. While the impetus for this project remains a mystery, the National Centennial events, held in Philadelphia in 1876, renewed national patriotism and inspired a wave of nostalgia for the antebellum past. This affection for the colonial period served to shift the American imagination away from the memory of the horrors of slavery and the realities of the Civil War—roughly 625,000 deaths, over one million casualties, and awful destruction, both to property and to the land—and direct it toward a bucolic imagined past. Almost immediately after Lee’s surrender, the historical event was translated into a plethora of visual material, including images in the magazine Harper’s Weekly and a print by the popular lithographers Currier and Ives in 1865, revised and reissued in 1873. The imagery of the surrender sought to present the complex negotiation ending the war as a decision reached between two equals, a conciliatory gesture for a nation facing an uncertain reunification. In his own depiction, Eakins indicates a tense balance between the two central figures, each general weighing down one side of the dark composition. Once a single sketch showing both men, Eakins’s composition was cut in two, likely by Charles Bregler, Eakins’s studio assistant. The portion depicting General Lee was in the collection of the Hirshhorn Museum in Washington, D.C., until the fall of 2011, when it was deaccessioned and sold at auction to an unknown buyer. Probably due to this account and others like it, Eakins portrayed General Grant, visible in the MFA sketch, as less ostentatious than General Lee. In the other half, General Lee, clad in his formal uniform, sits and waits for the terms of surrender. In the MFA’s half, Grant, attired in less formal grab, writes out the terms. Perhaps it was the action of writing that drew Eakins to this subject—he frequently represented that task in his paintings, most famously in his sensitive portrait of his aging father, The Writing Master (1882, Metropolitan Museum of Art, New York). As a sketch for an uncompleted painting, this work represents aspects of Eakins’s oeuvre that he avoided or abandoned, perhaps reflecting his desire for absolute fidelity. In his unswerving quest to capture the realism of the moment—through life studies, historical props, and his own photographic models—he could not paint the scene of surrender, an event that was too far in the past and lacked substantial physical evidence. Later, Eakins did complete one work relating to General Grant, sculpting (together with William Rudolph O’Donovan) the horses for two equestrian figures, Grant and Abraham Lincoln, for the Soldiers’ and Sailors’Memorial Arch in Brooklyn’s Grand Army Plaza in 1892. 1. General Horace Porter, “Grant’s Last Campaign,” The Century Illustrated Monthly Magazine 35 (November1887–April 1888): 145. 2. Kathleen A. Foster, Thomas Eakins Rediscovered: Charles Bregler’s Thomas Eakins Collection at the Pennsylvania Academy of the Fine Arts (New Haven: Yale University Press, 1997), 162. The artist; to Susan Eakins (the artist's wife); to Charles Bregler, 1931; to Mrs. Charles (Mary L.) Bregler; to her estate; with Christie's East, April 9, 1998, lot 37 ("Estate of Mary L. Bregler to benefit Charles Bregler Scholarship Fund"); with Alexander Acevedo, New York; with David Dufour, New York; with Alfred J. Walker, Boston, 2000; to MFA, 2001, purchase.